Venezuela’s municipal elections of December 8, 2013 took place in the context of ongoing struggle between Bolivarian revolutionaries who want to see the country advance towards democratic socialist goals and the counter revolution which aims at restoring a neoliberal regime. Although the elections were local, they were characterized by the right wing Roundtable of Democratic Unity (MUD), led by perennial presidential candidate and Governor of Miranda, Henrique Capriles Radonski, as an informal plebiscite on the Maduro administration and the Bolivarian project. This high risk MUD strategy ended up magnifying the eventual Chavista victory when the majority of the total ballots were cast for the United Socialist Party of Venezuela (PSUV) candidate and other allied leftist parties. This essay offers an analysis of the municipal elections as a decisive moment in the dialectic between revolution and counter revolution starting with the physical absence of the late President Hugo Chavez from the country in December 2012. The municipal elections were staged one year after an ailing President Hugo Chavez left for medical treatment in Cuba, having chosen then Vice President Nicholas Maduro to succeed him in case he did not recover from cancer. While Chavez’s closest advisors visited him at his hospital bed in Cuba, members of the opposition media raised questions about the legal status of Maduro as an interim-president and portrayed the Venezuelan government as a rudderless ship taking orders from Havana. 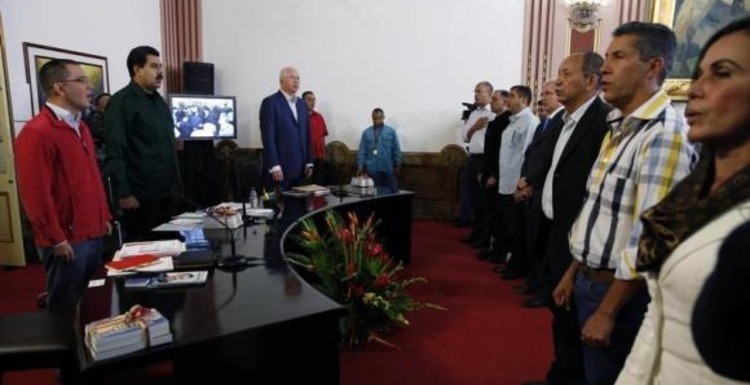 The opposition wasted no time in taking full advantage of the absence of the supreme commander from Caracas, and immediately stepped up the pace of its political and economic offensive against the Chavista project. The death of Chavez on March 5, 2013 triggered a hotly contested presidential campaign, while millions of Venezuelans were still mourning the loss of their president. The contest pitted right wing hardliner Capriles Radonski (MUD-PJ) against Chavez loyalist and protégé, Nicholas Maduro (GPP-PSUV). On April 14, Maduro won the election by a narrow 1.6% margin. After Maduro’s victory, Capriles made unsubstantiated charges of electoral fraud, but produced not a shred of evidence, as he called upon his followers to express their anger over his allegations. In the wake of post-election violence, directed mainly against Chavistas, eleven persons were killed and a number of buildings housing the offices of missions were reportedly vandalized. The National Electoral Commission (CNE) then carried out an audit of 100% of the ballot boxes at the request of Capriles, yet no one from the MUD showed up to participate in the audit. To the consternation of Capriles, the Secretary General of the OAS José Miguel Insulza recognized the legitimacy of the outcome of the election, as did most of the international community and numerous international observers who reaffirmed the CNE’s mint record. The CNE’s audit of the presidential election did not deter Capriles and his staunch ally, National Assembly Deputy Maria Corina Machado, from globe trotting in an attempt to gain international backing for their anti-Maduro crusade. The Venezuelan opposition envoys came away from their high-level visits empty handed. The Obama administration, following its partiality to the opposition, still refuses to officially recognize Maduro as president, while nevertheless dealing with Maduro as the de facto president. Absent any reasonable prospect to undermine the presidential election and with only lukewarm support being granted by the State Department, the Venezuelan right wing opposition put most of its political chips into the municipal election where it anticipated a resounding victory. In the aftermath of the presidential election, President Maduro faced immediate pressing economic, security, and political challenges that had accelerated when Chavez left the country in December. Maduro responded to the episodic shortages of some staple goods by enforcing laws against hoarding and by expediting food imports from Brazil and other producer countries. He also met with the president of Empresas Polar and other domestic business executives to negotiate increases in the production and distribution of food and other goods. Further aiding local businesses, he decided to allow price controls to be partially lifted on some commodities and to ease access to foreign currency. Maduro’s negotiations with big business did not go over so well with some of the Chavistas on the left who had begun to mobilize in the barrios against rising food prices and the hoarding of supplies. In some cases, organizers with bullhorns rallied in the market places of some of the barrios and questioned why the president sat down with the business sector and made decisions about the food situation, without first sufficiently consulting the voceros (spokespersons) of the base. Having campaigned as the son of Chavez, Maduro found himself under attack from the right as he urgently worked to assure the base of his faithfulness to popular power. Maduro now had to define himself at a moment of political and economic crisis. By launching a counter offensive in the “economic war” (June 2013), holding more than a thousand street meetings (gobierno de calle) to address the immediate needs of communities, and prioritizing the formation of communes (August 2013), Maduro has managed to re-cement the relationship between revolutionaries in the state and the popular sectors, and to take the political initiative away from the MUD. If the municipal elections were indeed an informal plebiscite on the Maduro administration and the Chavista project, Maduro managed to seize the reins of leadership just in time. Between December 2012 and the December 2013 municipal election, spiraling inflation (reaching 56.2% for 2013), episodic shortages of some staple consumer products, persistent crime, and a thriving black market for dollars, fueled charges by the opposition of gross mismanagement of the economy by the authorities. The same economic conditions evoked charges by the government that the opposition and its political allies in the private business sector were waging an “economic war” to undermine the revolution. So as news of toilet paper and corn flour shortages hit the press, so too did photos of warehouses that were illegally withholding commodities from the market and of a number of trucks containing smuggled subsidized food intended for the Venezuelan marketplace. While the black market in dollars rose to over five times the official exchange rate, many businesses were imposing exorbitant markups on consumer products. As a result, a stark contrast has emerged between the solidarity (below market) prices of products “made in socialism” and sold at socialist enterprises and the price gouging associated with opportunists and opponents of the revolution. Maduro has responded to the “economic war” by stepping up the counter-offensive using the Enabling Legislation (which passed the National Assembly on November 19, 2013), emergency imports of food, increased government regulation of prices and the beefed up enforcement of currency exchange regulations. An important sign that Maduro was serious about ratcheting up the enforcement of price controls and stopping the manipulation of supply, was the appointment of Eduardo Saman, in June 2013, to the post of president of the Institute for the Defense of People in Access to Goods and Services (Indepabis). Considered a radical Chavista, incorruptible, and popular with the grassroots, Saman declared that “the fun is over” for speculators in the private sector. Undeterred by an attempt on his life in October 2013 (the motivation for which is still undetermined), and fortified by the passage of the Enabling Law by the National Assembly in November, Saman has been leading the charge to contain and bring down prices on consumer goods, from food to car parts. President Nicholas Maduro knew how to read the popular clamor for strong action against big business. As prices came down and inflation decelerated in October, November, and December, morale began to elevate among the Chavista base. This counter offensive opened the political space for promulgating the Plan de Patria (2013 – 2019), which was seen as a more prominent part of the municipal election. The Plan, which served as Chavez’s platform during his 2012 presidential bid, emphasizes the permanent struggle for national independence and the co-responsibility for governance of the liberal democratic state and the organs of popular power. In the famous Golpe de Timon speech to his cabinet (October 20, 2012), Chavez had emphasized the paramount importance, as articulated in the Plan, of accelerating the construction of communes. Chavez entrusted the implementation of this objective to Maduro, he said, as he would “his life.” The Plan also includes an explicit commitment to eco-socialism and an all out national mobilization to attain food sovereignty and food security. The MUD six year plan, in contrast, seeks to de-ideologize and de-politicize the missions and other social programs. This arguably implies the dismantling of the communal structures that are, in the Chavista narrative, co-responsible players with the state in the transition towards democratic socialism. The MUD Plan also has emphasized private business investment over social property, the direct antithesis of the Chavista narrative. This ideological contest between 21st century socialism and a reconstituted neoliberalism and the promulgation of the Plan de la Patria informed the underlying politics of the municipal elections. Both the economic war and the underlying ideological struggle made each election over the past 14 months a vigorous contest for control over the instruments of state power. The MUD, or at least those solidly behind the MUD leader, Capriles Radonski, have insisted that the municipal elections were an informal plebiscite on the Maduro administration. Winning such a high risk wager could have fortified Capriles’s leadership of the MUD and paved the way for a recall election of the president in 2016. Things did not go well for the MUD in the municipal elections. There was an impressive turn out, for local elections, of 58.92% of the electorate as compared to the regional elections of December 2013 when turnout was 53.8%  The Great Patriotic Pole (GPP) and allied parties won three quarters of the mayoral races, though the MUD did gain some important cities. With regard to the total ballots cast, the PSUV won a majority over the MUD by more than six percent of the total ballots (49% to 43%). The margin for Chavismo is greater if one takes into account leftist parties that are outside the GPP. In any case, since the margin of victory with regard to the total ballots cast in the municipal elections was significantly larger than in the presidential election of April 2013, the MUD lost the informal plebiscite and more. For now, the Maduro administration plans to step up the counter offensive in the “economic war” and to seize the political initiative in the implementation of the Plan de la Patria. The electoral outcome may also indicate that the United Socialist Party of Venezuela (PSUV) and other leftist parties have begun to recoup some of the disaffected among their electoral base since Hugo Chavez’s victory at the polls in 2012. For its part, the opposition, by insisting on the plebiscite strategy, made a successful recall referendum in 2016 even less likely than before the municipal elections. Just days after the election Ramon Aveledo, the executive-secretary of the opposition Democratic Unity Table (MUD) coalition, offered his resignation pending the restructuring of the coalition and a critique of the electoral defeat. He called for more unity and clarity of purpose within the opposition. Capriles is likely to soon be replaced as leader of the MUD. Although there had been credible reports of sabotage, in particular against the electric grid,  and even allegations of a plot to assassinate President Maduro  in the months leading up to the election, on December 8 ballots were caste in an atmosphere of peace, without serious incident and Maduro has sought to maintain that climate of peace. On December 17, Maduro met with 70 opposition governors and mayors at Miraflores Presidential Palace in Caracas to “seal the collective will for peace. That’s the first thing. Peace above all, as the basis of harmony and coexistence among diverse positions.”  Opposition hardliners did not attend. The meeting started with the singing of national anthem to the recorded voice of the late President Hugo Chavez graced by the accompaniment of a chorus of citizens. It was obviously a peaceful gathering between deeply divided political foes. Some opposition participants argued that the Plan de la Patria and the communes illegally take up functions that are within the purview of the elected public officials. They also have insisted that Venezuela is a country of political pluralism with freedom of thought and that no one can be obligated to follow a socialist plan against their will. Given the deep ideological divide, it is uncertain whether this peaceful dialog is durable and if it will moderate the influence of hardliners in the opposition. The December 8, 2013 municipal elections in Venezuela is the story of the resilience of the Bolivarian revolution and of President Nicholas Maduro to lead an effective counter offensive to the serious political and economic challenges to his administration. The municipal elections also have regional implications because they provide reassurance that ALBA and PETROCARIBE agreements will be honored and that other independent Latin American associations such as CELAC and UNASUR will continue to grow and develop their political and economic clout. A revitalized Chavismo raises the morale of the left in Latin America that is similarly engaged in electoral contests. There may even be a diplomatic dividend as Washington and Caracas, still make overtures to repair their very damaged relationship. Frederick B. Mills, Senior Research Fellow at the Council on Hemispheric Affairs and Professor of Philosophy at Bowie State University; William Camacaro, Senior Analyst at the Council on Hemispheric Affairs. The authors identify candidates first by the coalition of parties that support them, then by their own party affiliation. The GPP stands for Great Patriotic Pole. MUD. Lineamientos para el Programa de Gobierno de Unidad Nacional. 23 de enero de 2012. Hereafter cited as MUD Plan. Sections 40 to 42 are relevant here.